Earlier today, Germany beat Romania by just about one full point at Länderkampf Kunstturnen in Obersiggenthal, Switzerland, highlighting just how much of a jam Romania could be in at World Championships next month. Both teams used the athletes who should be set to compete in Nanning, with a few small alterations for Germany. As they are still deciding between two athletes for the sixth spot on their team, they chose to give Worlds team member Cagla Akyol the day off in order to use this meet as a trial for Elisabeth Seitz on bars and Leah Griesser on beam and floor. Larisa Iordache performed wonderfully, winning the all-around, vault, beam, and floor titles. But she will have to keep up consistent all-around performances in Nanning, putting the bulk of this team’s weight on her tiny shoulders, which could be too much pressure for her. The team didn’t perform horribly, exactly, and had this been a three count situation like it will be at Worlds (it was four count here), Romania would have defeated Germany by three tenths. That doesn’t inspire much confidence, as two years ago Romania had ten full points over Germany. Of course, they lost superstars Sandra Izbasa and Catalina Ponor to retirement, Diana Bulimar is injured, and the bulk of their junior talent won’t join the senior ranks until next year, so they’re not officially crying for help just yet. This year is little more than a blip on the radar for them, but it still has the potential to be painful at Worlds, where Germany, Japan, Italy, and especially Great Britain have the potential to outscore them. Looking at the numbers, Romania has big potential on vault (where they have two DTYs) and beam (where Iordache and Andreea Munteanu have incredible routines). They’re good, if not fantastic, on floor…but their bars is absolutely dismal and brings their event total average down by a full point. Iordache looks much improved, and earned a 14.45 in the competition today, good enough for third place behind Germany’s insanely talented bar workers. But the next-highest score was Stefania Stanila’s 12.95, and behind her, Ana Maria Ocolisan brought in a 12.4 while Paula Tudorache earned a 10.2. Not counting that 10.2 would have helped in the team final, so the odds do look better in a three-up situation, but honestly, not by much. They are going to have to do absolutely everything they can in qualifications at Worlds to make sure they’re at the top, though at this point, knowing how much other teams are bringing to the table, it’s not going to be easy for them to stay inside that Big Four bubble. What about Germany? They’re not exactly without problems, but they have no major margin of error like Romania has on bars. Beam and floor aren’t exactly outstanding, but they can put up three very clean vaults and their bars are fantastic…between Lisa Hill, Kim Bui, and Sophie Scheder, they’re very solid on this event, but possibly having Elisabeth Seitz back just gives them added security. Seitz didn’t have her best bar routine today, but it was her first routine after a very long time away from competition due to multiple injuries. She must still contend for the final spot on the German World Championships team along with Leah Griesser, who competed today on beam and floor. The German team needs beam and floor more than they need an additional bar worker, but I’m not fully sold on Griesser. She was fifth out of the five Germans who competed on beam with just an 11.45, and her floor was okay but not enough to save them – she brought in a 13.15, the third best for the Germans behind Bui and Pauline Schäfer. However, Lisa Hill didn’t compete on floor for some reason, and Cagla Akyol wasn’t at this meet. Both can contribute higher scores here than Griesser can. As it looks, the sixth German to be added will be extraneous. If they go with Seitz, they’ll have possible insurance on bars, but if they go with Griesser, they’ll have a utility player on the two events with which they need the most help. Seitz is older and more experienced, Griesser is younger but won’t get the experience she needs for the future if they don’t use her here. It’s a much more difficult decision than I thought it’d be, though I think at this point I’d go with Griesser if only so Seitz can have some time off to recover rather than putting unneeded stress on her body when she won’t even contribute much more than they already have. The rest of their team looks to be doing well, even if Scheder had a rough day. Bui and Schäfer were neck-in-neck in the all-around, with Schäfer edging out the German national champion by two tenths to secure the bronze all-around medal. Hill put up a gorgeous FTY, a solid beam set, and a rock star bars routine, winning the title on that event. Had she competed on floor, she would have been right up there with Schäfer and Bui. It’s a very good team, and with the addition of Akyol for Worlds should compete very well in Nanning. Host team Switzerland came in third here, as expected. Giulia Steingruber took the silver all-around medal with clean and steady performances across all events. Ilaria Käslin proved what a great help she will be on bars and beam, events on which Caterina Barloggio also showed to compete well, if not coming in with the highest difficulty. Overall, the Länderkampf Kunstturnen meet offered a nice glimpse at what we should expect from these three teams at World Championships. Romania will want to spend the next few weeks really trying to build consistency among their younger athletes, if only because right now Iordache is the glue holding that team together. If something happens with an injury or falls in qualifications, this team will be lucky to make it into the team final. It’s looking that bleak. 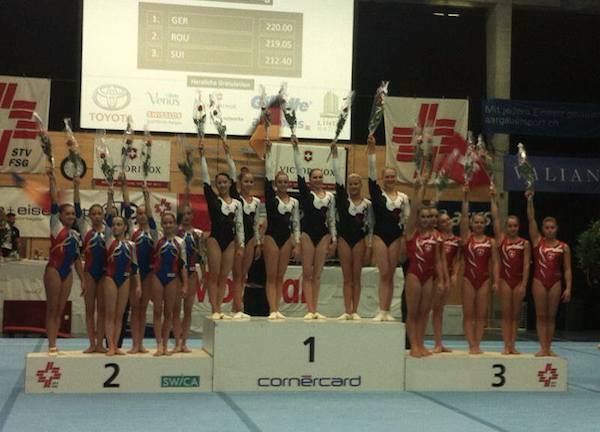 September 6, 2014 in 2014 Länderkampf Kunstturnen, Ana Maria Ocolisan, Andreea Munteanu, Caterina Barloggio, Elisabeth Seitz, Germany, Giulia Steingruber, Ilaria Käslin, Kim Bui, Larisa Iordache, Laura Schulte, Leah Griesser, Lisa Katharina Hill, Nicole Hitz, Paula Tudorache, Pauline Schäfer, Romania, Silvia Zarzu, Sophie Scheder, Stefania Stanila, Stefanie Siegenthaler, Switzerland. please post the leo panel for P&G’s! Man- Romania really is in a bind this year. They’re definitely counting down the days until Iridon and Jurca can join the senior ranks. I think they’ll revitalize the team and really put them back into the top. The Romanians somewhat downgraded their routines in this meet. For example, Stanila and Zarzu did not do their DTYs and Iordache did not do her full floor routine. But yeah Worlds is going to be hard not because it’s a terrible team, but because they’re lacking on bars so much. Qualifications at Worlds will bring them down because besides Stanila and Iordache, the rest of the girls can only really contribute on 1 or 2 events. Plus their bars total will be really low so they can’t afford a fall anywhere…. I don’t know, regardless, I will always root for the Romanians. I don’t think it’s so bad that they’ll be struggling to even qualify, but I’m hoping for the best. True but they were going to choose one Worlds member to sit out so they could test Leah and Eli. Cagla happened to be sick so it ended up being her, but a huge purpose of this meet was a trial for the sixth spot. I know that. Still, Akyol was scheduled to compete there (someone would have gone as an individual, just like Schulze did now) and your wording makes it sound like they just decided to let her off the team. They all were supposed to compete, Akyol, Seitz and Grießer. Don’t get me wrong, I love your work, I just thought I’d clarify! Sorry, I meant “they were all supposed to compete”.